It is, therefore, always recommended that one takes help of experts in drafting a provisional application. Important Payment Info: Even while you Order “Utility Patent Drawings” Now using Online Form Below, you may choose to Pay Later upon completion of the draft. We respect your confidentiality. We recommend you to sign a Non-Disclosure Agreement (NDA) before disclosing your drawing request. Check this box to sign the NDA. By checking this box, I confirm that i) I have read the Non-Disclosure Agreement thoroughly, I agree with the terms thereof and I sign the NDA on the date of checking this box and submitting the order, and ii) I refers to the information provided in my Billing Details entered during check-out. (Sketches, photographs, prototypes, videos, etc). How quickly would you like the illustrations to be delivered? Regular delivery timeline of 3-4 days is normally applicable for up to 10 figures. For more than 10 figures, we will confirm delivery timeline within 1 working day of order submission. A brief call with our expert before starting the search can improve the output astronomically. If you agree, please suggest a suitable time for the call. Utility Patent drawings or utility patent illustrations are one of the most important elements of patent process that improves the chances of getting patented your ideas and invention. Keeping this in mind thepatentillustrationscompany.com came into existence and since its inception it has been serving law-firms, corporations and independent inventors to get their ideas drawn in paper. With a team of technocrats and legal experts we can help you get the exact drawing you are intending to submit to the USPTO or your respective patent office. From a simple utility patent drawing to complex patent drawings we have the knowledge and experience to create patent drawings that will satisfy your needs and meet the stringent requirements of the USPTO and respective patent office. From margins to structure; lead lines, reference numbers and text to cross sections – all of our patent drawings are envisioned, built and prepared by highly trained professionals who have in-depth experience in the domain of patent drafting. 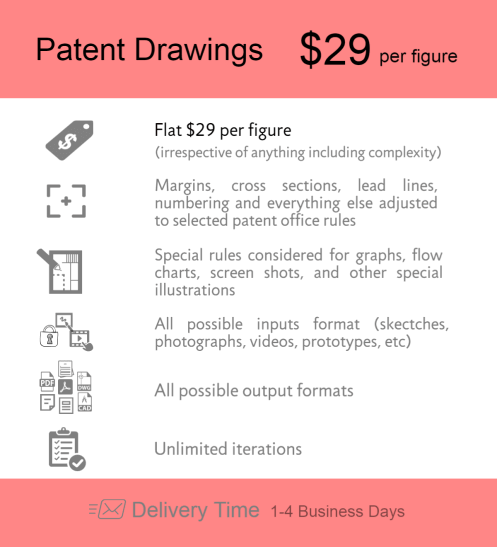 No matter whether you want to create patent drawings from photos, sketches, prototypes and every imaginable file format we are here to help you all along the way. All you need to do is place a call to us and our representative will be at your disposal to help you get the desired result.